For a map of the holiday park click here. 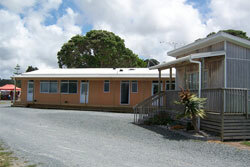 Showers and Toilets: Whangateau Holiday Park provides clean showers. Hairdryers are provided in both men’s and women’s amenities. A full Mothers room including baby bath, changing table and junior toilet is available in the Accommodation Block. We also have accessible family shower and toilet facilities with wheelchair access. Laundry: Our laundry facilities provide coin operated washing machines for hot or cold washes, and coin operated dryers. We have washing line space, iron and ironing board are available along with tubs for hand-washing. 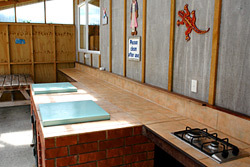 Cooking: We have a recently upgraded communal kitchen equipped with gas cooktops, microwaves, fridges, freezers, toasters, continuous boiling water and sinks for washing up with dishwashing liquid provided. You can also make use of our communal covered BBQ area. TV /Dining room: The dining/lounge room equipped with couches, tables and chairs. This room also contains a large TV with Freeview and camp library with stunning views overlooking the harbour. 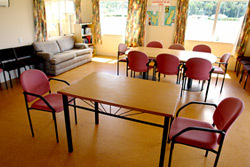 Accommodation Block: Our accommodation block contains: 2 x Family Rooms with Showers, 6 Basic Family Rooms. All rooms have outward facing windows, and external access. The 2 bathrooms are located on either side of the block one of which is the Mothers Room. Internet Access: We have WIFI throughout the park, available for purchase at reception.